REVIEW: Veggietales MacLarry and The Stinky Cheese Battle! 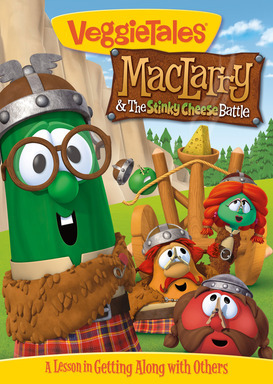 We had a VeggieTales movie night to test out the new release: MacLarry & The Stinky Cheese Battle! In keeping with other VeggieTales titles this one is a crowd pleaser! I especially like the "Barber-barians" lol It's fun for the kids and adults watching. Veggietales has a way of making their shows enjoyable for all ages. In our movie night the kids started out with Veggietales coloring pages and then we broke out the popcorn! My daughters favorite part of the movie were the songs. She sings them in the bathroom now :) I highly recommend this new DVD. It's a new family favorite and a great lesson about getting along with others! You can keep up with new releases with Veggietales on Facebook! MacLarry & The Stinky Cheese Battle is on sale for $14.99! I received a Veggietales Move Pack free of charge in exchange for my honest review.